I was out running last night (August 08, 2004) in the rain and I came across this strange snail. Malformed achitina fulica maybe?? Avril B. 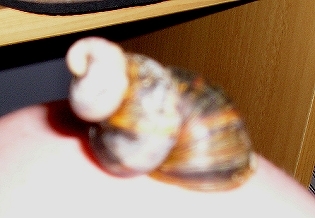 It is a scalarid Cornu aspersum (until recently better known as Helix aspersa) or European Brown snail (Petit Gris for the French). Your specimen is a malformed Helix aspersa. Geoff M.